Stress is everywhere, your to-do list is endless and the 24 hours of a day are not enough to satisfy the needs of your everyday life! If you are not in charge of your life you can easily get lost between work, family and personal “wants”. But if you can become a little more organized, you will notice that a day is enough to pursuit not only success, but also happiness. 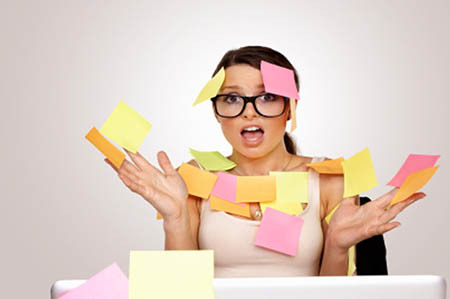 The following tips will help you organize your life better and find more time for pleasure. The environment of your home or office can affect the way of living and thinking. Clean up the area and remove any unnecessary objects and items you do not need and try to keep the space clean and tidy. If you tend to forget where you put things, try to put them in the same position every day. If you spend too much time finding what to wear, keep your clothes nice and tidy in the closet and you will save a lot of valuable time especially in the morning! In general identify activities that are time consuming and non-productive and try to find alternative ways to save time and become more productive. 2. Manage your time through reminders! Write your pending tasks in an Excel sheet (or Evernote, Google Keep or any other tool you want) and keep a list, which you must update on a daily basis. This is the only way you will be able to maintain a schedule and become more organized. 3. Turn your important tasks… into habits! When you repeat a task on a daily basis, you can turn it into a habit. If you do the same things every day, like for example making breakfast, checking your email, going to the supermarket, then you will definitely save time by doing these activities out of habit. Daily organization will help you achieve even your most long-term objectives. Instead of constantly making up excuses to yourself and others… try to get yourself together and make a fresh start. Stop complaining for example, that the day didn’t start off well and take responsibility. If you do not have a schedule in your life, even unconsciously, then nothing will be completed within the day. Perhaps, if you try for example to clean the entire house in one day… you won’t make it! But if you decide to clean one room at a time, then you will have time to do other things as well. It is important to have good judgment and be realistic about your expectations. If you don’t have the time to wash your clothes, take them to a cleaning service or hire someone who can wash and iron them. If you hate a chore at home or at the office you can get help from a professional, so you will still have time for fun and inspiration. Don’t try to do everything yourself and make sure that you set your priorities correctly. If you had to choose between paying someone to do the garden so that you can go for a drink with friends or do the garden yourself, what would you choose? After completing a task that needed a lot of work and attention, reward yourself! When there is a reward at the end of a task, things get a bit easier. Thank you for the great list. I find a lot of people do not realize how easily they are distracted and often for how long a period of time. Outsourcing has saved me time over and over again. Realistic expectations are important. Sometimes I give myself a little extra time to complete a task, so I am able to feel successful.